Busher lost the race. Red is out $100, but green bluffed and is spared this humiliation. Whew! A day at the races. You put up with the smell of horses because of the rush you get from betting on (and, let’s be honest, fixing) the proceedings. Will your favored horses carry the day, resulting in heavier pockets as you exit the track? Or will you be handing over the keys to your luxury sedan and taking the bus home? Savvy (and lucky) bettors will carry the day, and you hope that today it will be you! 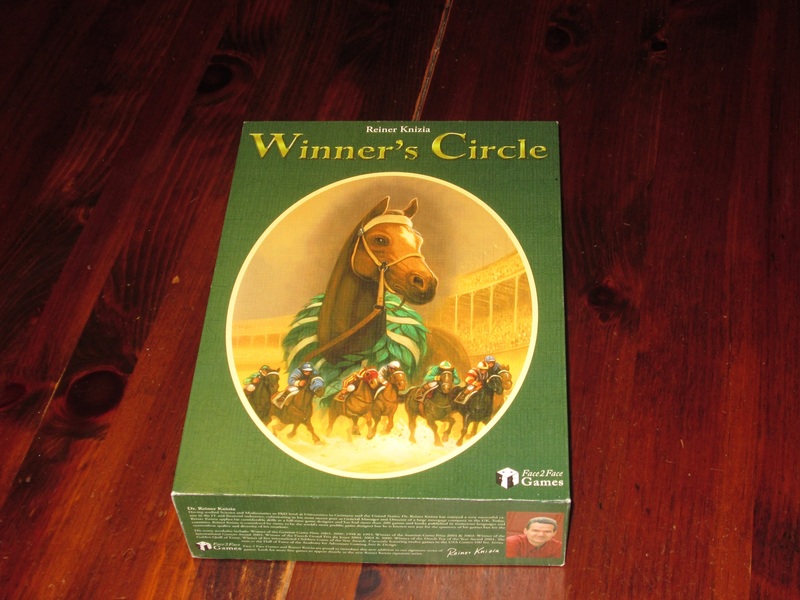 Winner’s Circle is a betting game for two to six players. 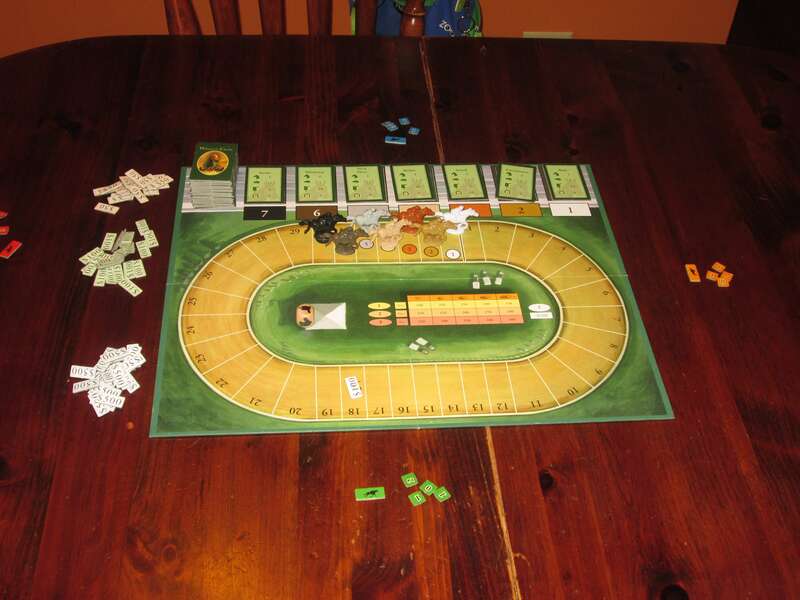 Players bet on the outcome of three races and then help determine the outcome of those races. The player with the most money at the end of three races wins. Winner’s Circle set up for four players. 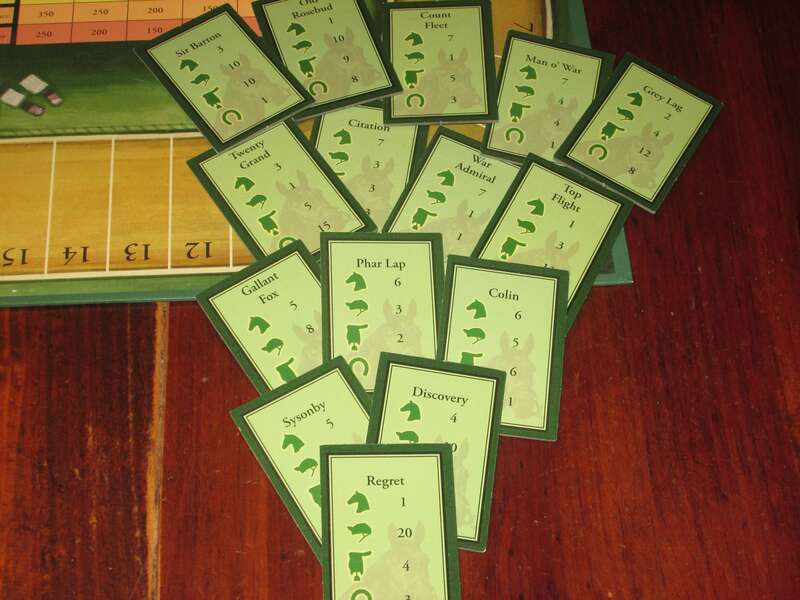 Each player receives a player marker and four bets of their color. The seven horses are placed in their starting gates, and horse cards are drawn and assigned to each horse in the gate. Players take turns betting, face-down, on the horses they think will win. In addition to their two regular bets, players have one 0 bet, a bluff, which they can use to throw off other players, and one 2 bet, which doubles their share in the horse. Each player may only bet once per horse. Once all bets are placed, the race begins. 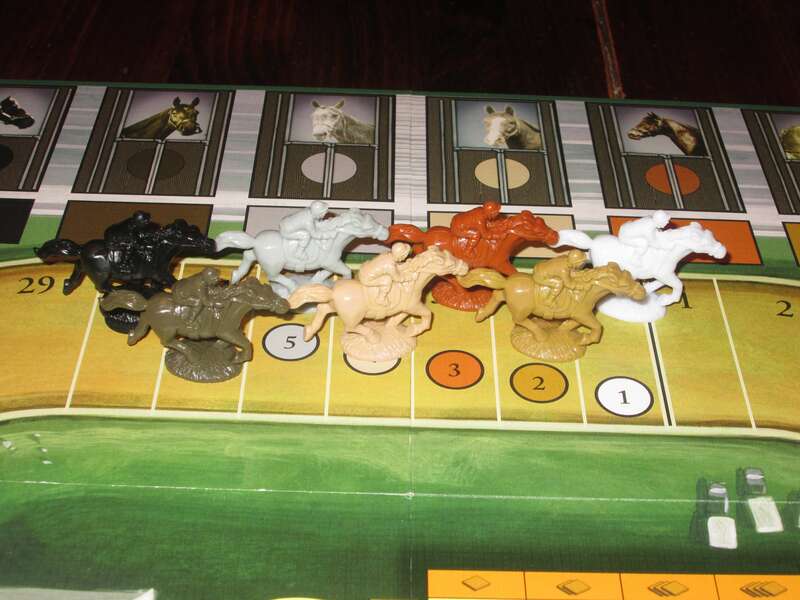 On a turn, players will roll the custom die and move one of the horses the number of spaces that corresponds to the face rolled. 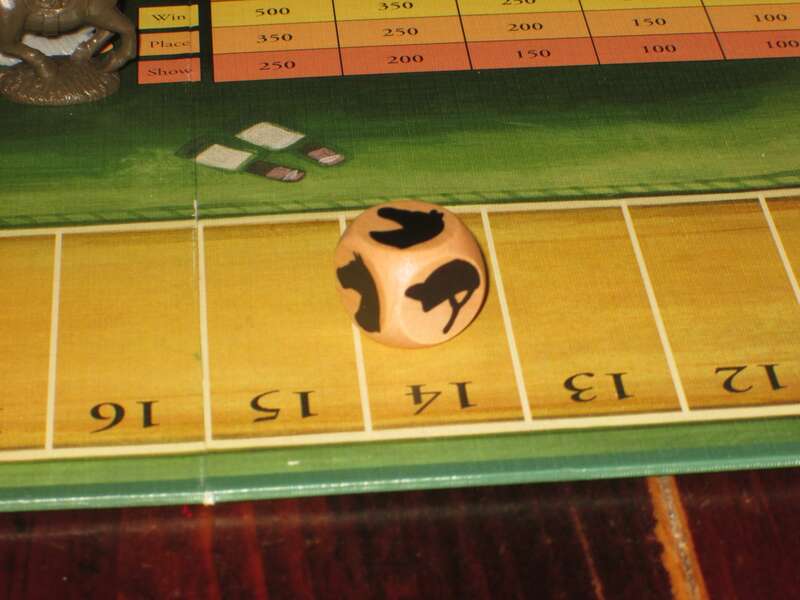 (The faces on the die do not have equal probability of being rolled.) Once a horse is moved, that horse cannot be moved until all horses have been moved. The rules are a single spread and are super easy to explain, especially since horse racing is something most people are at least in some ways familiar with. How refreshing! The first horse to cross the “pace” line pays out $100 per bet to everyone who bet on it. The round ends when three horses have crossed the finish line (win, place, and show). The horse in last place when the third horse crosses is placed in the losing space, and everyone who bet on the losing horse forfeits $100 per bet. The three winning horses pay out for each bet placed on them (they pay less or more determined by the number of bets on them). Players reset the board, deal out seven new horses, and the game continues. In the third race, the payouts are doubled. 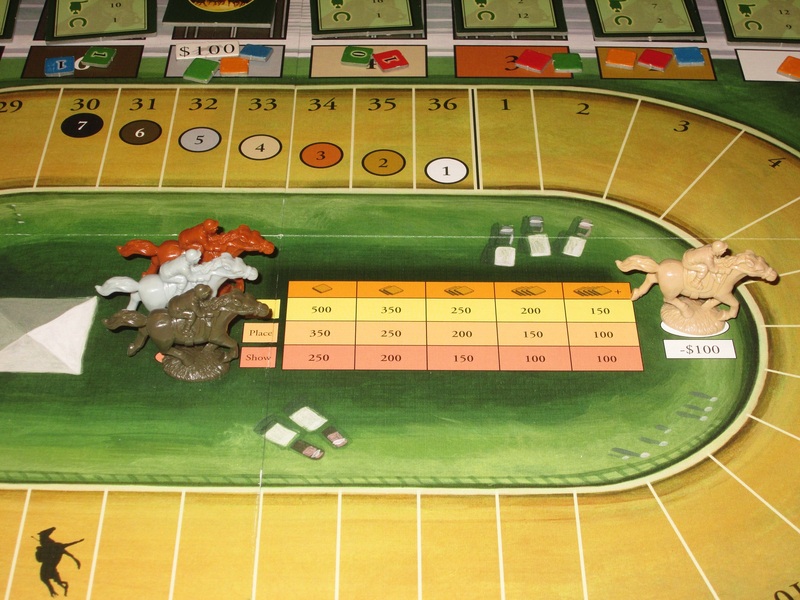 After three races, the player with the most money wins. Note: The blind betting described above is listed in the rulebook as a variant. It is the way to play the game. Trust me on this one. Triple Crown, or Put Out to Pasture? I’m not a huge fan of horses or of horse racing. I am, however, a huge fan of Winner’s Circle. Winner’s Circle takes the fun of gambling, the fun of player investment and engagement, and the fun of semi-cooperation and combines them to make an energetic and joyous experience start to finish. Devil Diver wins the pace chip! How lovely when players can work together. There are so many things I love about this game, but let’s start with the semi-cooperation. It’s helpful to think of Winner’s Circle in some ways as a stocks game. Players are “investing” in different horses, and each is hoping for their success (or at least their not-failure). Because each horse can have any number of bets on it, players naturally become teammates in cheering on (and effecting) the success of their horses. Wherever I’ve played my 2 bet, I’ve committed myself to that horse’s welfare. Similarly, if someone else has placed his or her bet on a horse I’m invested in, I can count on them to work for me. Whenever the right roll comes around on my turn, I’m happy to help another player so long as it helps me. But of course, that’s not the end of the story. There are several complicating factors. First, each player has a bluff bet, so for each player, there is one horse that they’re not really cheering for, despite their smiles and words of affirmation. I don’t mean to make this sound like Battlestar Galactica–it’s not–but in each game there is a slight air of paranoia, a “guilty until proven innocent” vibe that tacitly says to each other player, “I’m watching you. Prove your commitment by your deeds.” Players are cheering on all the horses, but there’s usually a moment in the race when you realize that another player is no friend of the horse you bet the farm on, and these moments of micro betrayal are wonderful. But semicooperation also happens in that while players want success for every horse they’ve bet on, each player has varying levels of investment in their horses overall, even beyond the bets they’ve placed on them. Winner’s Circle is cooperative: players invested in a horse are all cheering for its success. But it is also competitive: there is one winner. If there’s a player who has more money than you or more chance of success than you do, it might be worth it to hamper a horse you’ve bet on and divert your best efforts elsewhere. Horses also pay out more the fewer bets are on them (the “longshot” factor), so it may be better to advance a dark horse pick that fewer people are invested in than the golden goose that benefits everyone. It’s all about the money! This isn’t great money, but those who always complain about paper money will have nothing–no, they’ll still complain. Semicooperation sounds sweet, but Winner’s Circle can be downright nasty. Any player can move any horse that hasn’t yet moved on their turn. This means that sometimes it’s best to move your own horse closer to victory. Then again, it might instead be best to stuff an opponent’s horse so they can’t cross the finish line. Because each horse moves differently on each rolled symbol, no matter what you roll, you feel like you’re affecting the game. If you roll the symbol you need, great! If you roll something that will hamper another horse, it is tempting every time to forgo your own gains just to stop the leader. And you can also “move” a horse in a way that keeps them where they are. Since each spot may only have one horse on it, horses that land on an occupied spot get bumped to the spot behind. Early in the game, it’s common to prevent the horses in last place from moving at all. I’m not usually keen on spite in games, but here, it is one of the game’s strongest features. Winner’s Circle is incredibly interactive, and you’re invested no matter whose turn it is because anyone can move the horse you’ve bet on. The die in Winner’s Circle. 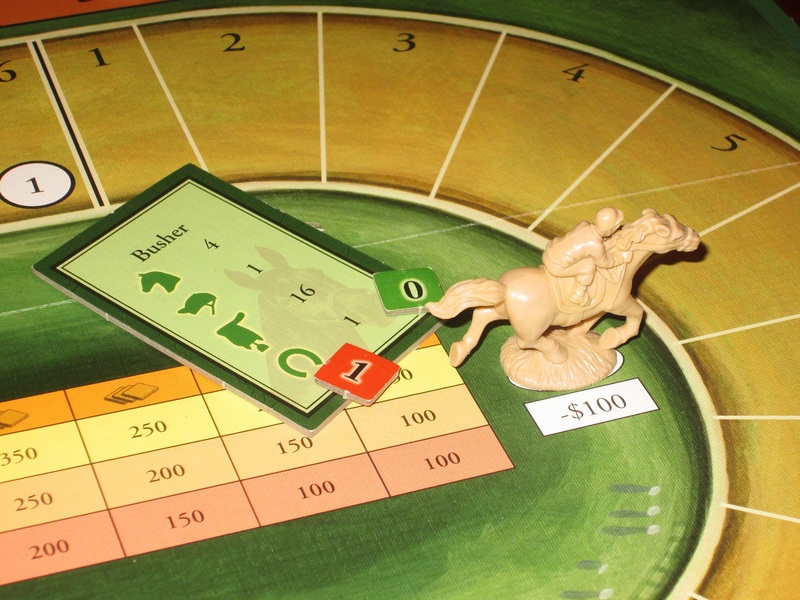 Each turn the active player rolls the die and chooses a horse–any horse–to move. This may seem like an innocuous decision, but it can be tense and nasty. Winner’s Circle, as you might expect from a racing and betting game, has quite a bit of luck in it. Yet this luck isn’t crippling to the game, and the reason for this is that players have enough control to make decisions but not enough control to math out a victory. Winner’s Circle is a game of probabilities, and the odds are clear at the start of the game. Horses that move well on the horse head are harder to hamper and are usually the favorites. But with enough player investment, even a longshot horse can cross the finish line. Players have to weigh the risks of the longshot horse before the race begins, and sometimes they have to bet on a horse before they know if anyone else will join them in their quixotic pursuit. This is what gives the game so much of its punch, because while it’s pretty clear at the outset who the favorite horses are, the race is steered by individual players. (This system of deciding which horse moves–but a horse can’t move again until all horses have moved–is pure genius, by the way.) And even probabilities are just that. They aren’t certainties. It’s exciting when things go awry, or when a horseshoe is rolled three times in a row. Winner’s Circle combines the best of gambling with enough control that your choices matter. 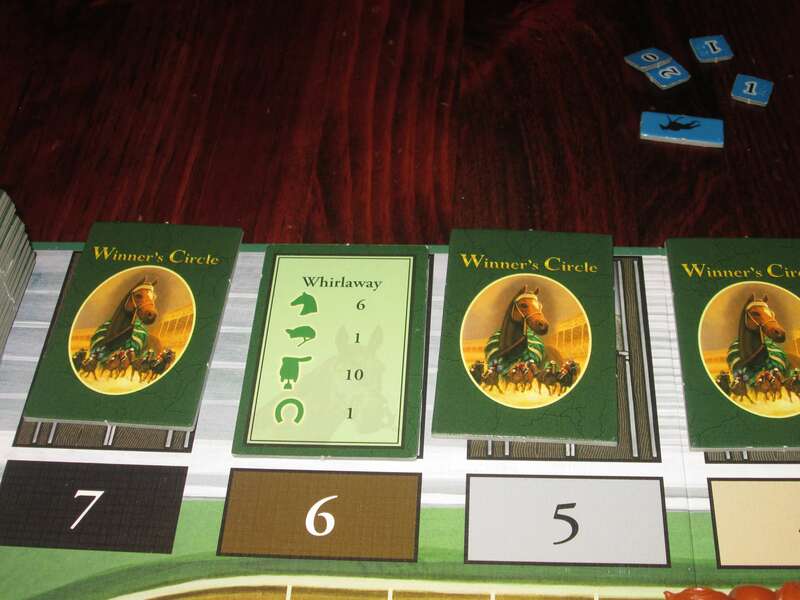 Even though each horse card looks the same, the horses in the game–with their horsey names–take on a character and feel of their own, to the point that players become emotionally attached to certain horses. There’s another quality to Winner’s Circle that’s hard to put my finger on. For now, I’ll call it its character. I’m an unabashed Euro fan, so wooden cubes don’t really bother me, but I will readily admit that I scarcely get lost in theme. Am I playing with wood, brick, and stone? Doesn’t matter; I need a brown, a red, and a gray cube. What the cubes represent usually is not important to me so long as the puzzle is interesting. Winner’s Circle, however, has a character to it that invests players in what they’re doing and almost fully removes any layer of abstraction that might be set up in the game. I never cheer for “the brown horse”; I cheer for Twenty Grand. Or War Admiral. Or Sir Barton. The horses are all named, and the individual horses take on a character of their own. There’s Regret, whom you probably will regret betting on, but you can’t help it. (He moves twenty spaces on a single roll if the roll is right. Which it never is.) There’s poor, bland Sysonby, whom everyone thinks is a good bet despite my warning that while he can’t be hampered, it’s also difficult for him to get any significant gumption. And the neat thing about this is that horses retain their identity from race to race. There can be two almost identical horses to bet on, but my money’s going on Twenty Grand because of the experiences I’ve had in prior games. “We’re going all the way this time, Twenty Grand!” Instead he fails me again, but I just keep coming back. The theme–I almost want to say the attachment–that comes through in the atmosphere of the game affects the ways players make decisions, and the game is better for this. Winner’s Circle is not without its problems, although thankfully, they are mostly cosmetic. 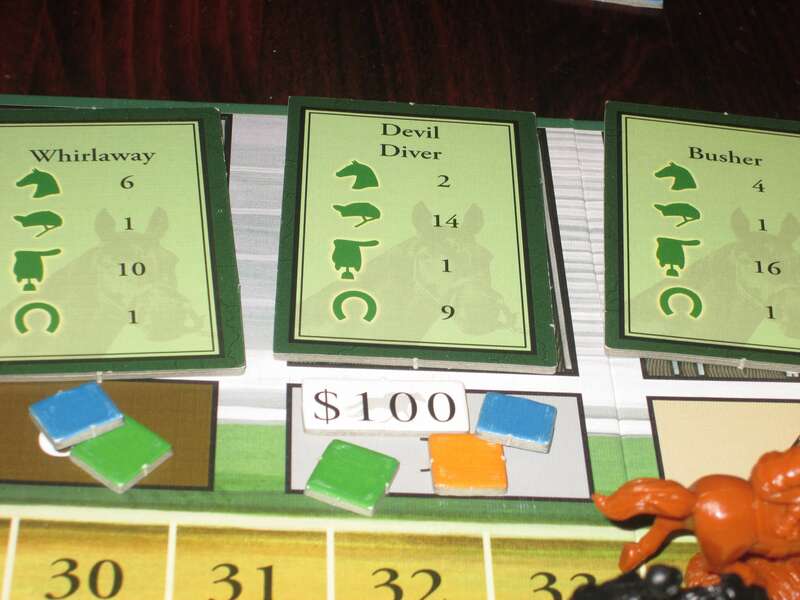 I get that the colors chosen for the horses in this game are thematic (there are no “horses of a different color” here), but it baffles me that a game that banks on being able to tell at a glance the state of the race uses such similar colors for all of the competitors. “Which one is Regret?” “It’s the brown one.” They’re all the brown ones! Or at least enough of them are that it’s difficult to tell who’s who. 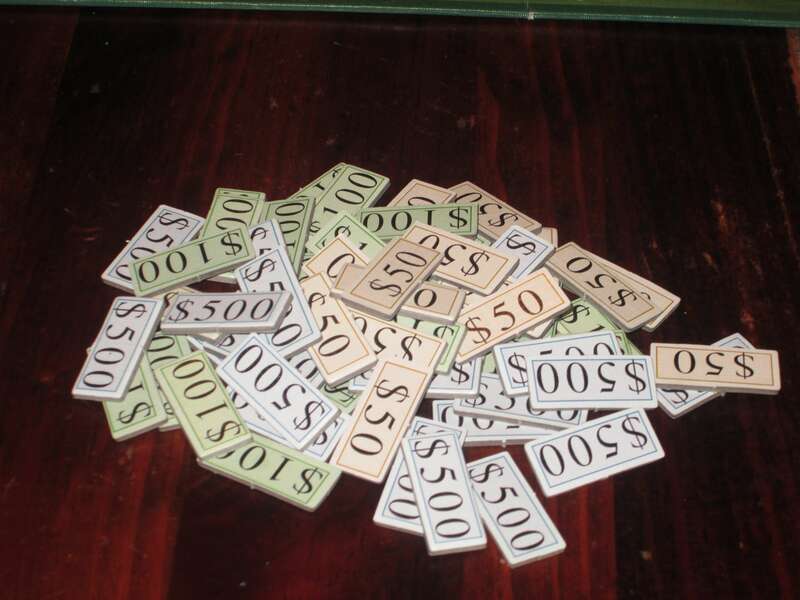 The money chips in the game are on thick cardboard, and some may prefer them to paper money, but I think I would have preferred paper money. The design on the chips is boring, and they’re pretty small. 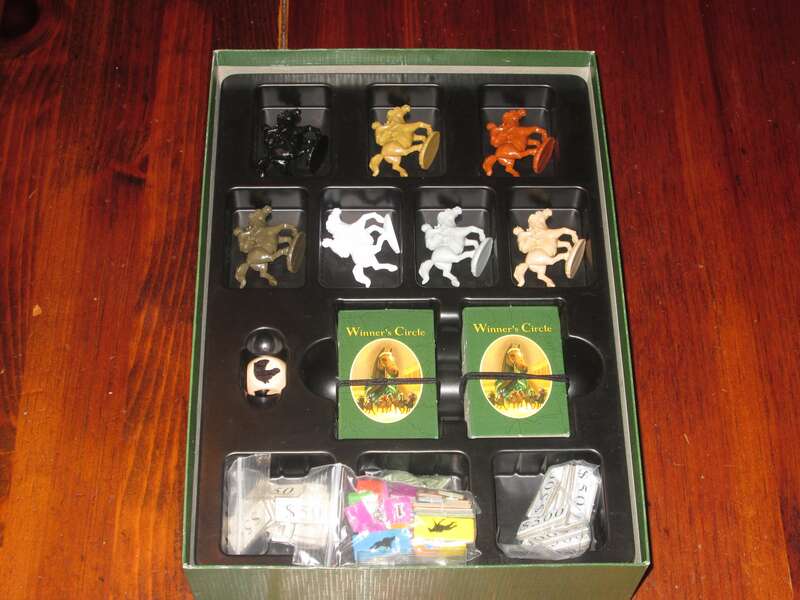 The horse tiles are nice and functional, although they are a little hard to shuffle, so I probably would have preferred cards. All told, it’s a shame that a game this tremendously fun has such a dull look that, from a usability standpoint, seems kind of phoned in. The insert is quite handy in this game. These horses made it to the winner’s circle. Well done! But if too many people bet on you, you won’t be worth much. Oh, and the beige horse is the loser here. Everyone who bet on it now loses $100 per bet. Sad! 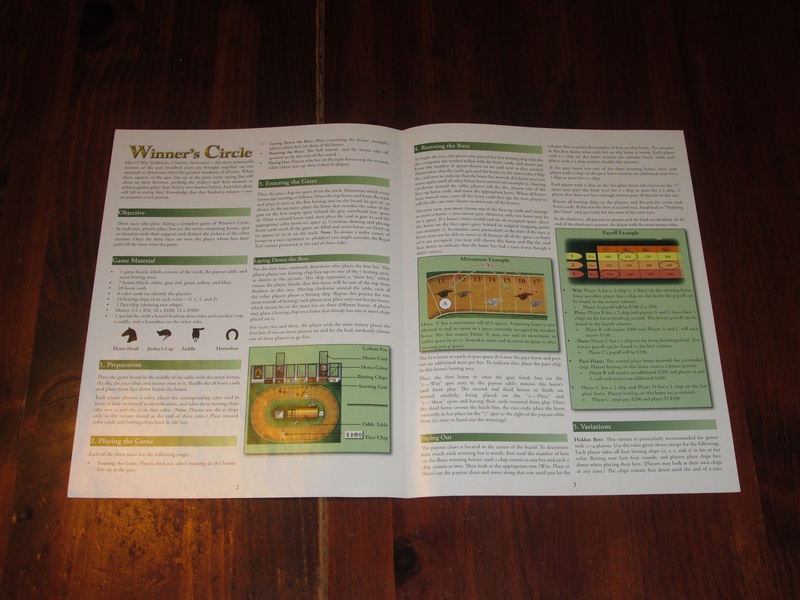 Winner’s Circle is a joy to play, one of the most interactive and fun experiences you can have on the tabletop. In fact, in my recent top ten social lunch games list, Winner’s Circle took the top spot. It produces tense choices, constant conversation, and riotous cheers each time I bring it out. I am always willing (and eager) to play this, and I have still yet to win. Ignore the theme (if you don’t like horse racing). Ignore the drab, “realistic” components. This is a perfect mix of probability, luck, and strategy. In short, Winner’s Circle is a winner. Great post! Admittedly, I”m a fan of Front Porch’s Stretch Goal, but this one seems to have more of, well, everything. Coupled with the fact that I do admire Knizia’s work, including a game picked-up at Origins for my daughter, Lost Cities. I’ll have to give this one a try at some point. You will! And hopefully the new edition will be easy to come by. This is one that I’m surprised was allowed to drift out of print.